I had the good fortune to record this cd by a generous Jazz Fellowship Grant from the Pennsylvania Council on the Arts. …the beauty of his tone (an impressive achievement when you realize how thoughtfully he improvises on piccolo and alto flute) marks him as a talent to watch.” Norman Weinstein in the Boston Phoenix, August 1996. “Adler displays his well-founded confidence by closing with a solo alto flute version of “’Round Midnight” that more than holds its own among the many recent renditions of the oft-played tune. A fitting ending to an enjoyable date.” David Dupont in Cadence, October 1996. "A musical thread throughout the album is Adler's individualistic approach to improvisation. His full rich tone and the use of special effects allow him to create an assortment of thoughtful and energetic solos." Curt Yeske in The Trenton Times, March 1996. Flute Improvisations placed #6 in Temple University's Jazz-FM WRTI, Top 10 New Releases for March 1996 of recordings in heavy rotation at that time. 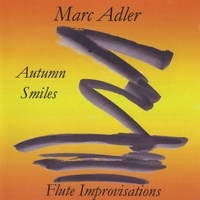 For a pdf of the tune "Autumn Smiles" as well as a transcription of my solo go to the Jazz Education tab.